GET introduces a new range of performance ECUs for the electronic management of the innovative 2-stroke fuel injected engines developed by KTM and Husqvarna, the 250 & 300 EXC-TPI & TE-i models. 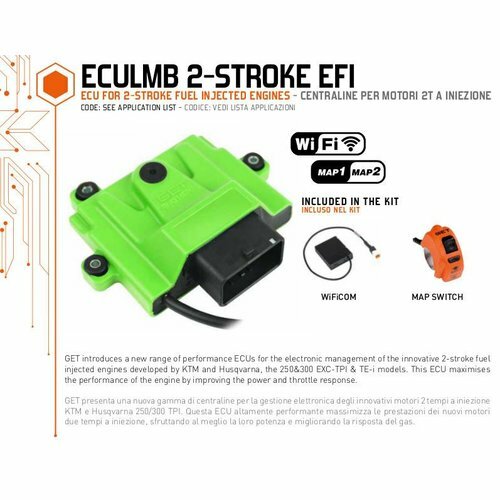 This ECU maximises the performance of the engine by improving the power and throttle response. Also the MAP Switch is included and allows you to switch on the fly from MAP1 to MAP2. By using the different optional tuning tools such as the WiFi-Com or one of the the 2 Maya Software licenses you can individually adjust the engine mapping to your needs. Thanks to this new system, the driver can focus solely on finding the best balance and best tracks with his feet on the pegs. It enables you to enter curves at a higher speed on any surface. Better control on slippery surfaces and easier driving are probably the most notable and important advantages of a GPA. GET is the first and only company in the off-road industry to provide riders with a smart device to modify and adjust the main engine parameters on the map. Connect via WiFi your smartphone or tablet (Android or iOS) and adjust parameters in a totally safe range. At any time, you can easily restore GET Factory map. WiGET App. Search: “WiGET ATHENA” on your app store (or click the link below) and download the app for free.